DIDforSale SIP Trunks for Grandstream. SIP Trunks from DIDforSale are are tested and verified to work with Grandstream IP Phones and PBX’s. If you own an existing Grandstream phone system and are not happy with your existing SIP provider you can easily switch to DIDforSale as trusted Grandstream SIP Trunk provider and keep your existing VoIP phones and PBX system. Our SIP Trunks are fully tested and verified to work with grandstream. Step by step grandstream configuration guide is available for you. We have carefully packaged our pricing plans to make it a justified choice for your Grandstream SIP trunks. Choose a plan that works for your business. A brief architecture of the big picture will help you understand what role does Grandstream PBX play in your communication application? Grandstream IP PBX (Private Branch Exchange) is one of the many IP communication solutions provided by Grandstream. When using Grandstream IP PBX the calls sent to you by your phone provider are forwarded to Grandstream IP PBX. From there the switch determines how to route those calls. In cases where calls are routed to analog phones the adapter is used as a liaison between the switch and the analog phone. With redundant networks, A+ QoS and exceptional customer service its hard to look away from us! Our SIP Trunks are fully compatible with Asterisk and integration is extremely easy. You can start off with free trial prior to migration. Build a fully scalable and flexible system with largest SIP Trunk Provider in nation. There is no minimum and you flexibility to increase or decrease SIP Trunks. Right on you can start testing our SIP Trunk Service with Grandstream for free. We understand that sometimes things might not be as simple. Our highly qualified technical team is there to answer any questions for you. You can Contact them by visiting https://www.didforsale.com/contact. A decision you are not going to regret. Our SIP Trunks are fully tested with Grandsream. 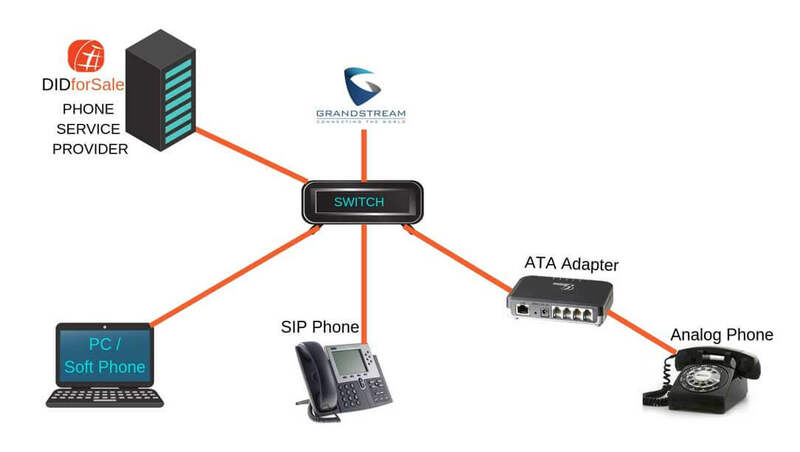 We do provide technical support to configure SIP Trunks with your Grandstream IP PBX system. You can create SIP username and password and register your Grandstream PBX with our gateways or you can use IP to IP authentication. Do you support other IP PBX's? Yes, we support wide range of IP PBX and VoIP Phones. Get a complete list by visiting https://www.didforsale.com/compatible-ip-pbx-sip-trunks. Try our SIP Trunks with your Grandstream IP PBX and you will never look for another provider!